Professor James E. Coleman Jr. will be honored with the Raeder-Taslitz Award from the American Bar Association’s (ABA) Criminal Justice Section in October. The award recognizes a law professor whose excellence in scholarship, teaching, or community service has made a significant contribution to promoting public understanding of criminal justice, justice and fairness in the criminal justice system, or best practices on the part of lawyers and judges. Coleman, the John S. Bradway Professor of the Practice of Law, serves as director of the Center for Criminal Justice and Professional Responsibility, co-director of the Wrongful Convictions Clinic, faculty advisor to Duke’s Innocence Project chapter, and associate dean for special projects and priorities. He teaches classes on criminal law, wrongful convictions, capital punishment, legal ethics, negotiation and mediation, and appellate practice, and focuses his scholarship on the legal, political, and scientific causes of wrongful convictions and how they can be prevented. 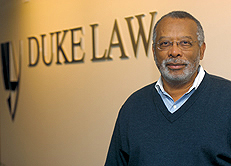 Coleman joined the Duke Law faculty in 1996 after a long career in government service and private practice, including 12 years as a partner at Wilmer, Cutler & Pickering in Washington, D.C., where he specialized in federal court and administrative litigation and represented criminal defendants in capital collateral proceedings. His time in private practice was punctuated by two short teaching sabbaticals at Duke Law where, in 1991, he developed the first law school death penalty clinic in the nation. Early in his career Coleman served as assistant general counsel to the Legal Services Corporation, as chief counsel to the U.S. House of Representatives Committee on Standards of Official Conduct, and as deputy general counsel to the U.S. Department of Education. In private practice he incorporated significant public interest and pro bono representation into his heavy litigation caseload, and in 1987 he received the NAACP Legal Defense Fund’s Pro Bono Award for contributing to the enforcement of civil rights. Coleman has worked extensively with the ABA on matters related to capital representation. He served as chair of the ABA’s Section of Individual Rights and Responsibilities when the organization was developing its death penalty moratorium project and subsequently chaired the ABA Moratorium Implementation Project Steering Committee, which worked to encourage states to impose moratoria. He successfully lobbied North Carolina governors on behalf of death-row inmates and obtained the first-ever grant of clemency by then-Gov. Michael Easley on behalf of a client facing execution. In the Wrongful Convictions Clinic, Coleman teaches students about the many causes of wrongful convictions and supervises their investigation and advocacy relating to claims of innocence made by incarcerated felons. Since 2010, the clinic’s efforts have resulted in five exonerations, including the full pardon of LaMonte Armstrong, who served more than 16 years of a life sentence for a 1988 murder. In his capacity as director of the Duke Law Center for Criminal Justice and Professional Responsibility, Coleman, who also chairs the N.C. Commission on Racial and Ethnic Disparities, drafted an amicus brief on behalf of North Carolina’s now-repealed Racial Justice Act, which allowed defendants convicted of capital crimes to rely on statistical evidence to argue that race was a material factor in their death sentences. Levi’s nomination was enthusiastically supported by a number of Coleman’s colleagues and former students. Benjamin David, the elected district attorney of New Hanover and Pender Counties in North Carolina with whom Coleman has collaborated on a number of projects, wrote to the Criminal Justice Section: that “Each time that I have an opportunity to work with [Coleman] I am reminded how fortunate our profession is to have professionals who seek to give the wrongfully accused relief from their convictions and to teach students to act with integrity as they wade through contentious circumstances." Coleman will receive the Raeder-Taslitz Award on Oct. 23 in Washington. D.C., during the fall meeting of the Criminal Justice Section, which is co-chaired by Duke Law alum James Felman ’87. The award honors the memory of Professors Myrna Raeder and Andrew Taslitz. Raeder, a professor at Southwestern Law School and the first woman to chair the Criminal Justice Section, focused her scholarship and advocacy on criminal law reform in such areas as the special needs of women in the criminal justice system. She also led the development of ABA policy seeking to protect against wrongful convictions and contributed to many other initiatives. Taslitz was a professor at the Washington College of Law at American University and chair-elect of the Criminal Justice Section when he died in 2014. He joined the faculty at American, where he established and directed the Institute for Criminal Justice Practice and Policy, after serving more than 20 years teaching at Howard Law School. During the 2000-2001 academic year, he was a visiting scholar at Duke Law and a friend of Coleman and his wife, Professor Doriane Lambelet Coleman. “Doriane and I knew ‘Taz’ from our time in D.C., before he visited here at Duke,” said Coleman. “He was fearless in writing honestly about the criminal justice system, even when it might have made some uneasy. He was also a role model for legal educators, a loyal colleague, and a very nice person. I am delighted to receive an award that associates my career with Taz and the impact he had on criminal justice and legal education.